It was bound to happen sooner or later. After floundering for decades, R&B-infused pop has found its heart and soul again, thanks — at least in part — to the influx of a younger generation of artists with ears for older styles. At the same time, though, these up-and-coming acts — despite their commercial successes — haven’t completely sealed the deal to supplant their predecessors. Instead, they largely have co-opted their heroes’ works, modifying them with merely modest, contemporary production flourishes. This essentially has left room for quite a few outfits to regain their relevancy, and the best of them have accomplished this feat quite effectively by putting everything into perspective. Just as the garage-rock revival provided the thrust that turned the Rolling Stones’ A Bigger Bang into its best album in decades, young songwriters such as John Mayer have fueled Steve Winwood’s quest to return to the loose, organic grooves of his days with Traffic and Blind Faith. 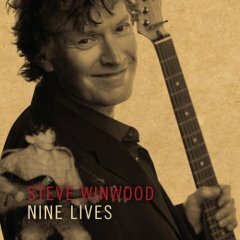 To put it simply, Winwood’s latest offering Nine Lives is not only the most relaxed, effortless, and cohesive set of music that he has made since embarking upon a solo career more than three decades ago, but it also is the culmination of his pursuits over the past 15 years — a time that found him reuniting with Jim Capaldi and temporarily severing his ties to the major-label system. The lesson to be learned, here, is to never count out an industry veteran, especially one who helped to expand the boundaries of rock ’n‘ roll between 1965 and 1972. Winwood long has been searching for the right balance between the modern-day marketplace and his earthier roots. As he moved from Traffic’s 1994 effort (Far from Home) to his final album for Virgin (Junction 7) to his independently issued outing from 2003 (About Time), he gradually has let go of his need to bury his songs beneath a slick, commercialized exterior. With Nine Lives, he finally has found the sound that he had been seeking. Although there is a level of sparkle to the endeavor, the precision of both the production and the arrangements serves to buoy rather than suffocate his material. Right from the outset, with the circular, acoustic-blues chug of I’m Not Drowning, it’s clear that Winwood’s recent reunion with Eric Clapton was one more piece to the puzzle he was trying to assemble. A few songs later in Dirty City, Clapton himself turns up to provide a searing, turbulent guitar solo that tugs and pulls against the swirling, gospel-bred waves that emanate warmly from Winwood’s Hammond B-3 organ. It is precisely this give-and-take between life’s gritty, grim realities and the human quest for salvation that weighs on Nine Lives. Throughout the set, Winwood sings about gangsters and gunrunners. Yet, he also threads his tales with the hope that someday redemption will come. This same dichotomy winds through his music, too. The air of anguished perseverance that clings to I’m Not Drowning is comforted by the luminescent soprano saxophone solo that winds through the Van Morrison-esque Fly. Elsewhere, Winwood adapts global rhythms to fuel the funky, loose-limbed beats of Raging Sea and Hungry Man, and the driving R&B groove of At Times We Do Forget inevitably gives way to Other Shore, a mid-tempo, Ray Charles-like hymn. Nine Lives is available from Barnes & Noble.